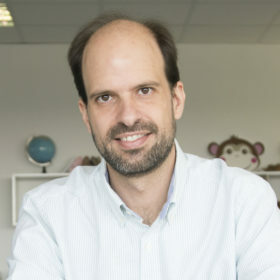 Enrique Bretos is the co-founder and CEO of Pisamonas. Enrique was born and raised in Spain, a country known for its high-quality footwear. In 2002, he graduated from Polytechnic University of Madrid (UPM) with a degree in Aeronautical Engineering. Fresh out of school, Enrique started working as Head of Engineering at Pullmantur, a travel agency and cruise line headquartered in Madrid. In 2006, Pullmantur was acquired by Royal Caribbean Cruises. This posed a unique opportunity for Enrique to learn the nuts and bolts of working for a global company. By 2012, he was Managing Director of both Pullmantur’s airline and tour business. A few years earlier, while he was still working at Pullmantur, Enrique, his wife, and another couple opened a small shoe store in Madrid, Pisamonas, as a side project. Both couples had young kids and understood firsthand the difficulties of finding beautiful, durable shoes for their children at affordable prices. Pisamonas started as a small multi-brand shoe store in Montecarmelo, a neighborhood famous for its high density of young families. From the get-go, the store was a success, reaching $250K in sales during its first year. Nevertheless, the founders knew that in order to take the company to the next level, they needed an experienced CEO. In 2015, Enrique quit his job at Pullmantur to become Pisamonas’s fulltime CEO. Realizing the immense potential of selling direct-to-consumer online, Enrique decided to transform Pisamonas from a store into a brand. To launch this new model, the company cultivated a network of 40 local suppliers and producers, created a design team, and built an omni-channel sales strategy. Pisamonas is a Spanish kids’ footwear brand that combines great design and affordable prices. Pisamonas sells primarily direct-to-consumer online and offers free delivery and free exchanges to six different markets: Spain, Portugal, France, UK, Italy, and China. The company also runs ten brick-and-mortar stores in Spain and is looking to expand its offline presence in the country.